WATCH: Hillary & Bill Clinton Take On The Mannequin Challenge! - Ooooooo La La! 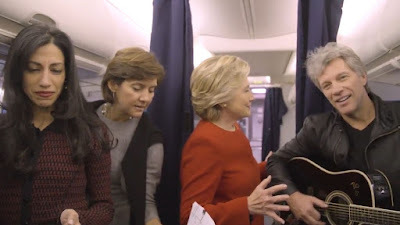 WATCH: Hillary & Bill Clinton Take On The Mannequin Challenge! Today's the day to vote for our next president! Hillary Clinton took on the Mannequin Challenge on her campaign plane on Monday. Former president Bill Clinton and Jon Bon Jovi also joined in on the challenge. The video is captioned: "Don't stand still. Vote today." Smart move to reach the young voters!